Sell-out Sen. Kamala Harris, while attorney general of CA, ordered subordinates who had already uncovered 1000 illegal transactions by Steven Mnuchin's Bank One of California, to drop the whole thing; the attorneys under her control, were already working on another 1000 cases, not quite ready for prosecution when the order was given. 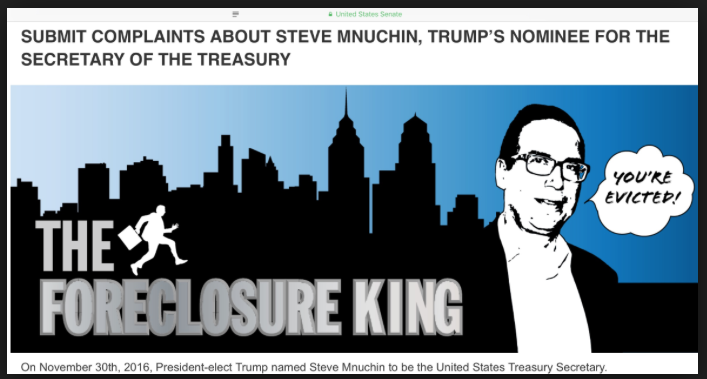 Of course, Mr. Mnuchin is now a Trumpocrat, Secretary of the Treasury. Now, in an effort to allegedly "save" the Democratic party from impending destruction*, she is now urging fellow DemonRATs to sell out to Donald Trump! 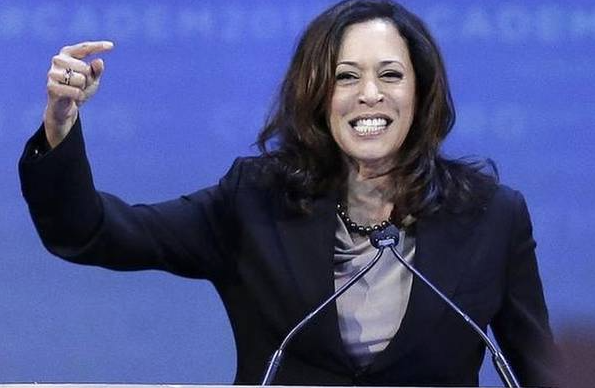 Amid all the self-reflection and infighting among Democrats about how they find their way out of the wilderness, Harris is emerging as a more nuanced political character than many on either side of the political line expected. If this was nuanced, then it reveals the Dumbocrats to be only a half-step away from openly declaring themselves as Republicans. Actually for Progressives this might actually be a good thing as a previous essay has already requested, albeit in a slightly different manner. The pressure on Harris to unwaveringly fly the flag of the resistance is intense. She recalled the event in Los Angeles where she encouraged supporters not to turn their backs on Sens. Heidi Heitkamp of North Dakota and Joe Manchin of West Virginia — red-state Democrats some liberal activists would like to purge — in their upcoming reelection bids. Yea! Kamala, this is really striking a move for enhancing the Progressive cause. You will definitely see the Bernie Bros. clamoring to support you here. That's a lovely word, Kamala, sure to inspire Berners with affection and sympathy for your views. Don't get me wrong, this is not a back-handed smear of berners. No!. It is a fore-handed smear. Yes Kamala has learned many of the traits which have made Hillary Rotten Klinton so beloved by the right and the Progressive left. Yeah, you know just like one of her biggest supporter, Fracking Jerry Brown. But despite pressure from activists on the left, Harris refuses to rule out working with the White House. I wudda thunk she were already working with the WH, via her close personal friendship with Steve Give-Me-Money Mnuchin. Sigh. *On a sad note I just came across this breaking news, which almost broke my heart: Hillary has almost (but not quite) given up on running for President again. could you explain to me the difference between a democrat and a "sell out democrat"? @on the cusp I think I read about Real Democrats around the time of that FDR fellow, vaguely remembered by sell-out Democrats. Please help me as I get confused easily. Al Ed, could you explain to me the difference between a democrat and a "sell out democrat"? Amongst the rank-and-file, there are still plenty of Democrats who are still democrats (note capitalization). My family is rife with them. Unfortunately, few to none of these folks are in any sort of power in the party. They have yet to come to terms with the bitter fact that the Party of FDR and JFK is today as dead as these gentlemen themselves are. There are still millions of Democrats who remain Democrats because they believe in the New Deal and the Great Society. These have yet to deal with the fact that the "sell-out Democrats" have sold them out, and have handed the 50 pieces of silver they got for it over to our enemies. The response around here, i.e., c99p, was to #DemExit. The main difference is that the non-sell-out flavor of Democrats haven't done so yet. I maintain that they will, however, as the realizations strike them as they have struck us. @thanatokephaloides The misguided remaining New Deal Democrats haven't learned that the DLC and its derivatives have done away with the party, except for the name. fruited plain... Red State Repubs are actually being challenged by mainstream and Librul Dems. That would NOT have happened had $Hillary won, and something some of us predicted would happen if she lost. Welcome to the revolution. Dems take back the Senate in 2018, the House in 2020. Another thing that wouldn't happen had Her Highness ended up winning last Fall. TOP, however, already taking credit. @Wink Democrats not backing single-payer. After the ACA implodes (soon, by the way; Iowa just lost a major insurer--and this gets worse almost monthly), establishment Democrats will have to "convert or die". Any Democrat not offering a better solution to peoples' misery will be seen as no advantage to the miserable people. if they do, doomed if they don't? Not buying it. 2018 may not be 2010's tsunami, but Dems will pick up more seats than they lose, top to bottom. That hasn't happened since, well, forever. #3 Democrats not backing single-payer. After the ACA implodes (soon, by the way; Iowa just lost a major insurer--and this gets worse almost monthly), establishment Democrats will have to "convert or die". Any Democrat not offering a better solution to peoples' misery will be seen as no advantage to the miserable people. @Wink but unless they campaign on a truly Progressive platform, rather than DNC crap, they will not attract any new voters. I do not expect any positive efforts to emanate from the Dumbocrats unless they make at least some effort to propose good programs, even though they lack the actual firepower to get these programs enacted. I will say this, which should be a lesson to the Corporatist $hills infesting Team Blue, is expect Tulsi's stature to keep rising amongst progressives and even conservatives. The true measure of that can be taken by how much flack she starts receiving from NYT/CNN etc. Tulsi and Turner 2020--TnT 2020!